Alice Robertson of Tidy Homes began her career in the home organization industry as a professional house cleaner, which involved A LOT of decluttering. Over the years, she has helped clients get rid of everything from old mattresses to outdated electronics to entire closets worth of clothes. “Luckily, we don’t have to haul it off to the dump anymore. There’s a way to recycle just about everything!” says Alice. Here are her tips to decluttering your home while keeping the Earth and environment in mind. Decluttering your home is a huge undertaking. Even if you declutter your home regularly, each time can lead to going through, reusing, and getting rid of more stuff than you even thought you had. However, when you get rid of anything in your home, it has to go somewhere. Sadly, if you aren’t careful, many of the things you throw out will end up in the landfill. Instead, you should be careful of where and how you get rid of items you no longer need when decluttering your home. Luckily, there are many ways to get rid of your old belongings that are eco-friendly. Many items can easily be recycled. This includes most appliances. For example, small appliances are relatively easy to recycle, because they are mostly steel. Furthermore, many appliances also have microchips, which contain valuable materials that can be reused. In some areas, it is even illegal to simply throw out these electronics because their parts and materials can so easily be repurposed. You can check to see if other items can be recycled by looking for certain labels. The Huffington Post has a chart that explains each symbol so you can quickly tell whether or not something you’re looking to get rid of is recyclable or not. For things that are still working and lightly used, you can look into donating them to someone in need. Clothes are a huge donatable item, but others, such as books and toys, can also be given away. You can also donate art and craft supplies to nursing homes or low-income pre-schools. Toiletries, cleaning supplies, and all those toothbrushes you get from the dentist can also be donated to those in need. Diapers are also a huge need in many communities, because they are not covered by federal assistance programs but are extremely necessary for a baby’s health and well-being. Bikes, cellphones, and sturdy bags are also needed, and can be donated locally in your community. When it comes to pictures, newspaper articles, and other important pieces of paper that you don’t want to get rid of, you can scan them and upload them onto the cloud. This will allow you to clear out clutter but still view them. When you’re done, you can recycle your pictures and other documents. When you’re done decluttering, you’ll probably discover that the space that was once covered with stuff is now dirty and in need of cleaning. It is impossible to clean under and around piles of clutter, and after finally cleaning it up, it quickly becomes apparent that the area needs a lot of cleaning. Plus, now that the space is clear, you will have to keep it clean in the future. To motivate yourself in this task, you might want to invest in a quality, upright vacuum. Having a good vacuum will encourage you to use it, which will make keeping your space clean an easy task. Many upright vacuums have adjustable heights, which makes them great for a variety of floorings. You might also want to look into green cleaning products. According to The Spruce, using green cleaning products can make your home safer, protect your health, and can even save you some money. To use truly green products, you might even want to consider making your own so you know exactly what is in each product. Decluttering your home is a big undertaking and can lead to a lot of waste and unneeded belongings. Instead of sending your unwanted stuff to a landfill, we recommend using some of the tips in this guide to lessen your impact on the earth and get your belongings to those in need. Design is so fluid and everyone has an opinion about what is in and what is out, including myself. For me, I feel like it is very important to read design magazines and watch home design and renovations shows to keep up to date on what my clients are seeing because this is what they being told they need to do in their own homes. 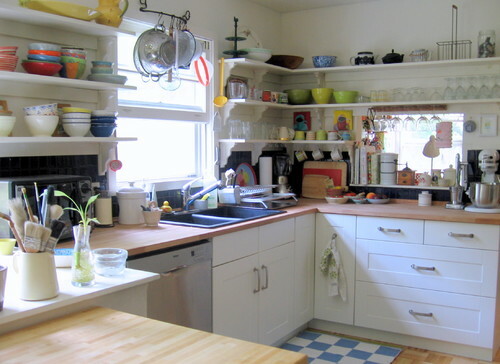 One of the trends I have been seeing a lot of lately on the renovation shows is doing open shelving for all of the uppers in a kitchen. Is this a good idea? Even though this is a cute curated open shelving kitchen, is it practical or just pretty? My opinion is NO, DON'T DO IT! I honestly feel like this is the worst recent trend, and I would advise my client's against it. I feel like the open concept shelving with the perfectly aligned cups and bowls next to fresh potted greenery on top of a curated stack of cookbooks looks fabulous on TV and magazine photos, but it is not practical nor is it realistic for everyday use. I don't know about you, but I value every square inch of my cabinet space and am very glad I can hide as much away as I can. Another thing to remember with open shelving...more dusting (my least favorite thing to do) and they tend to get cluttered looking very quickly. Can you imagine dusting all of this? 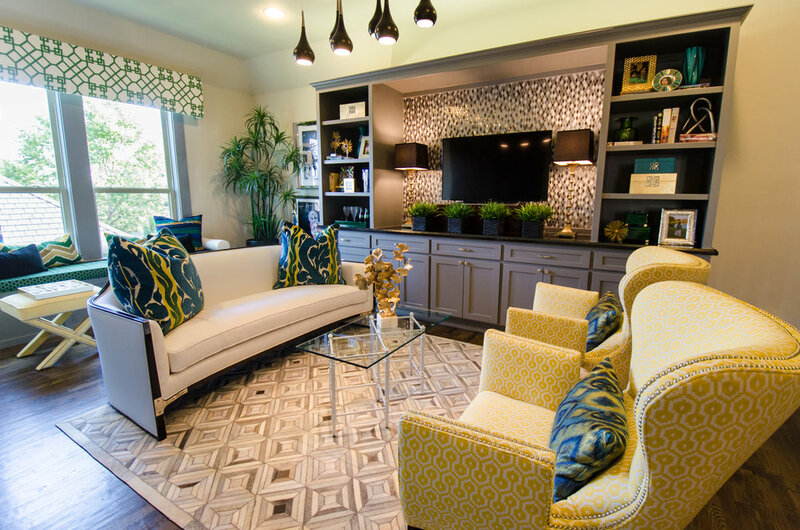 So why are so many design and remodel shows pushing this trend? Easy, it's cheaper than traditional closed cabinetry and when you are in the business of buying fixer uppers for cheap, remodeling, and selling for a profit, it is simple to see why flippers are doing this to save costs. I will say I am not 100% against any open shelves in the cooking area. I think open shelving can be done properly in small doses to create a nice design aesthetic. Here are some great examples of how they have been used in a tasteful way that makes sense. The open shelving around the kitchen sink works great in this design. Because the sink is in the corner of the kitchen, the open shelves allow for a less boxed in feel. This design has used open shelving at the end of the kitchen to leave the space feeling open without sacrificing a lot cabinet space. I like the blend of closed and open shelving here. The coffee bar/butler's pantry is a prefect place to have open shelving. It is one area that makes absolute sense for this type of design impact. Remember, this is just my personal opinion. If you are gung-ho about putting up a wall of open shelving around your kitchen, by all means, go for it, because the most important thing to remember when designing is you have to be comfortable and happy in your home. Animals play a huge role in interiors spaces. For hundreds of years, hides have been used inside the home from trophies on the wall to hides on chairs. They are perfect for adding natural texture, pattern, and a feisty spice to a room. 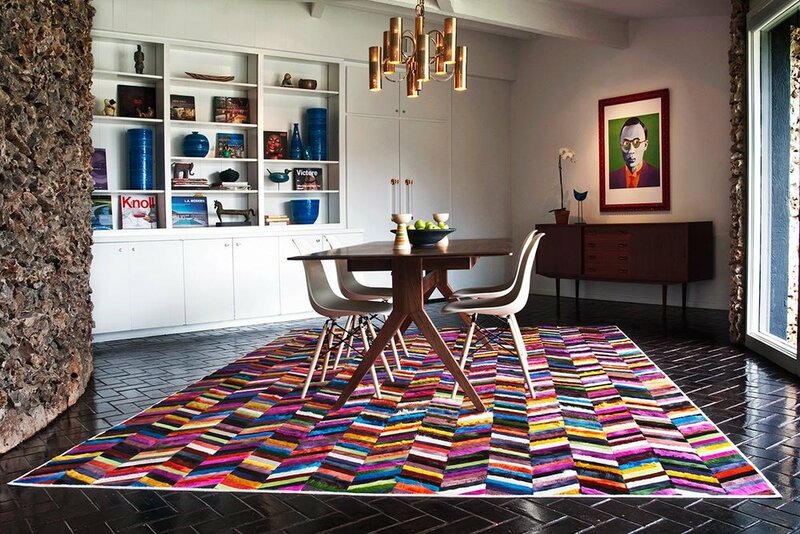 My favorite way hides have been modernized for today's designs is in the rugs. Here is how you can utilize hide rugs in an updated way! This metallic rug does wonders by reflecting the light flooding in from the windows. I love the dimension. Elevation of style is what this metallic hide rug does in this luxurious closet design. A client's upstairs landing featuring an all neutral patched together hide rug. 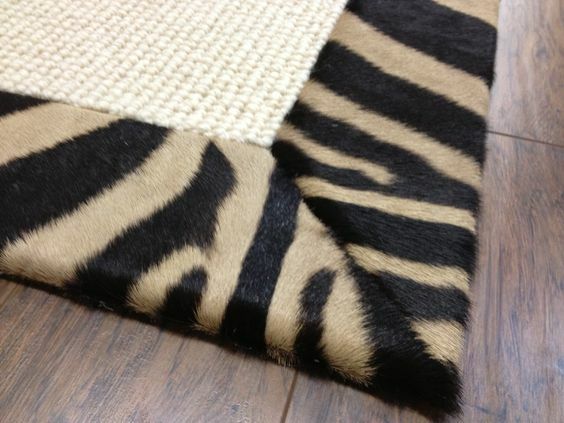 Linear designed patched hide rug. Very structured look. Light pink dyed hide rug in a kids room. Super durable! 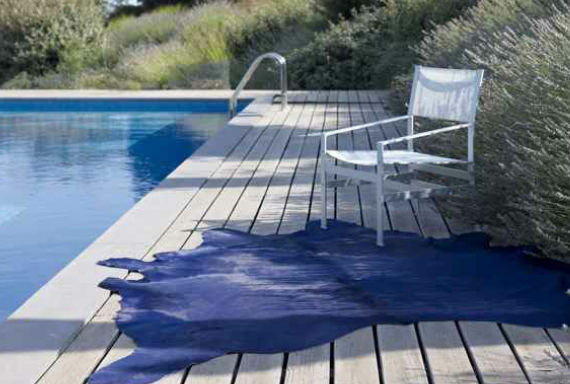 Design possibilities are endless with colorfully dyed and patched hides. How fantastic are these natural colored hide rugs with navy dyed pieces patched in featuring updated designs! How hide rug printed like a zebra. Run free tiger cow...run free. Just a touch of animal in a room can be understated with a simple banding around a sisal rug. Even more understated hide banded sisal rug because it is tone-on-tone. Pink is in the house! I haven't seen an interior color trend take over so quickly since shades of grey and I have to admit, I am on board! Shades of pink even made me Top 5 things I just can't get enough of for Spring. 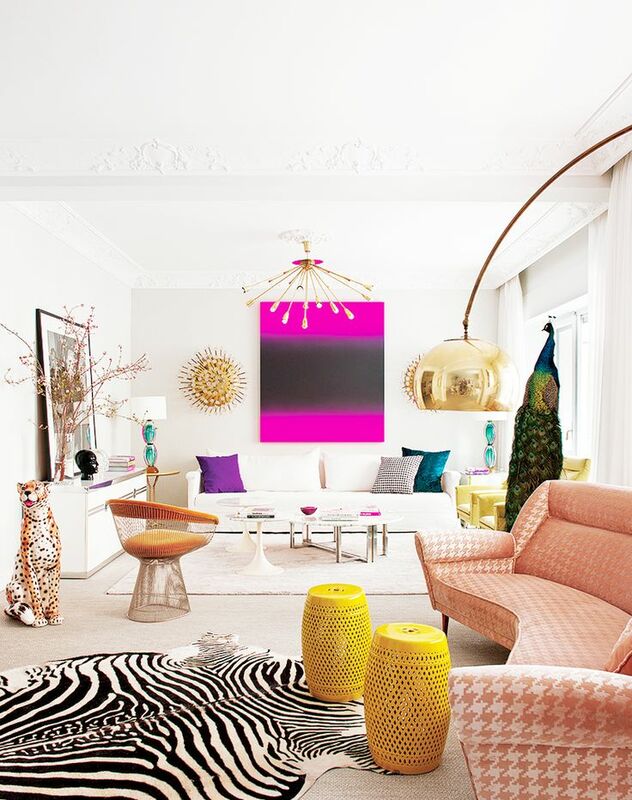 Here are some of my favorite examples of pink being used in todays interiors.